I can clearly remember the day I first went in search of ‘The Pulpit’ as it was just after I began letterboxing, I had come across what was then (and still is today) one of the best letterbox stamps I had ever seen. It was a rubber cut stamp depicting what looked like a bible thumping preacher of old sermonising on hell and damnation (see opposite). Having only seen the stamp I had no idea exactly what or where ‘The Pulpit’ was, the only information I had consisted of a vague nod in the direction of Trowlesworthy Tors. Having got out there and being a complete Dartmoor novice I was faced with a plethora of stone features any of which could have been the mysterious ‘Pulpit’. On the Trowlesworthy Tors are numerous outcrops that could have been suitable platforms or ‘pulpits’ from which to preach to an assembled congregation. Was the name ‘pulpit’ simply a dialect corruption and in fact referred to a ‘pit’ of some kind ? By following the compass bearings given in the letterbox clue I eventually found myself at a stone row and circle and not long after came across the letterbox, however I still had no idea what was ‘The Pulpit’. Once I got home I picked up what was then my one and only Dartmoor book and was informed by William Crossing that: ‘we come to a double stone row intersected by the Clay Works leat. It runs about N and S and is 142 yards in length. At its northern end is a stone circle known locally as the Pulpit…‘, (Crossing, 1990, p.430). So there it was, for me another piece of the Dartmoor jigsaw but more importantly the first step in research which would eventually lead to my Masters degree, mind you, at the time I never knew it. Against all practices this page will only concern itself with the actual stone circle despite it being part of a large prehistoric ritual landscape containing other rows, cairns and kists. The stone circle stands at the northern end of a double stone row at Ordnance Survey grid reference – SX57643 63785. 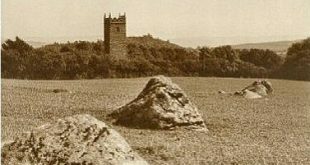 The actual circle has a diameter of 6.5 metres and consists of eight stones which vary in height from0.6 – 1.2 metres high and like many of Dartmoor’s monumental features has been subjected to ‘restoration’ sometime in the 1890s, (Butler, 1994, p.171.). An English Heritage field investigator visited the circle in 2001 and came to the following conclusion : ‘The alleged cairn at the head of the row comprises a ring of eight stones a maximum of 1.2m high with no evidence of a cist and very little to suggest the former presence of a cairn. It would seem more likely to represent the remains of a small stone circle’, (online source – see Pastscape Record on opposite link). What fascinates me is why a Bronze Age stone circle has managed to earn the name of ‘The Pulpit’. According to J. Ll. W. Page, he was told by a Mr Davies who was the warrener living at nearby Trowlesworthy Warren that the name referred to the fact that the location was once used for preaching, (1895, p.273). Whilst the Pulpit and preaching theory seems logical the location certainly does not, as can be seen from the photographs opposite the site is rather exposed to say the least. However, it is said that in every tale there is a grain of truth and if this is the case here then maybe open air services were held at the stone circle, weather permitting. Could it be that this was a case of deliberately ‘Christianising’ a pagan site of ritual worship as can be seen in other examples across the country? All it needed was to hold a Christian service at the site and in theory this would have removed all so-called pagan associations from the past. Another fascinating aspect of this particular stone circle is the large stone which stands next to the double row because when viewed from the east it takes on the appearance of a arrow or spear head. Clearly this was not a natural formation and at sometime in the past has been fashioned by the hand of man, (see photo opposite). Now, whether this was done by the original circle builders back in the Bronze Age or at a later date nobody knows. Butler, (p.171) favours the idea of it being formed in more recent times although I would suggest that it’s form would have more significance (as an everyday object) to a person of the Bronze Age. Butler, J. 1994. Dartmoor Atlas of Antiquities – Vol. 3, Tiverton: Devon Books. Page, J Ll. W. 1897. An Exploration of Dartmoor, London: Seeley and Co. Ltd.